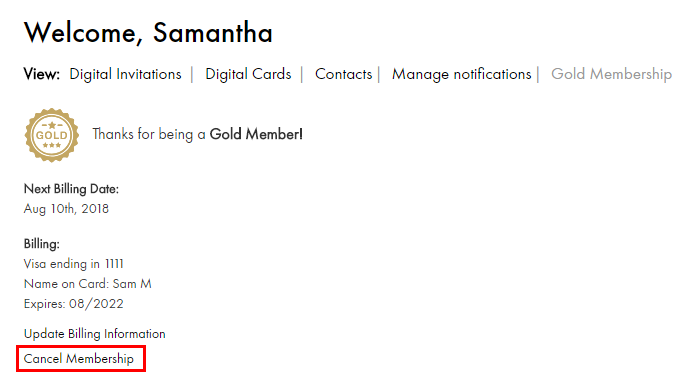 To cancel your Gold membership, sign into your Party City account and click on the tile that says Digital Invites & Cards. You can also directly access this page here. Click the Cancel Membership link on the Gold Membership screen. Note: The membership features will remain active and available to use until the end of your current billing cycle. If you wanted to cancel your membership and receive a refund, send an email to help@digitalinvitations.partycity.com. As long as you are within the 30-day money back period, we can offer a full refund. Not seeing a cancel option? This may indicate you have a free account. Free accounts cannot be canceled. Note: The Cancel Membership option for Gold memberships is currently not available within the Party City mobile app.